Hy-Vee Seasons is a publication of Hy-Vee, covering food, lifestyle and health. Each issue features Hy-Vee products and services, plus content on entertaining, fitness and nutrition. 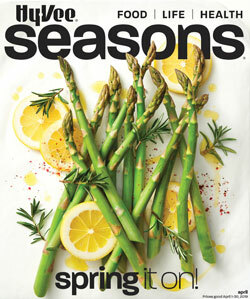 Hy-Vee's Seasons magazine is your source for the freshest trends in food, entertaining, healthy living and more. Each month, your Seasons magazine will help you find ways to celebrate the season with recipes your whole family will love, nutrition and fitness ideas, celebrity features, beauty and fashion tips, and a whole lot more. 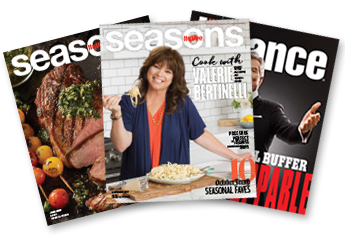 Find the latest edition of Seasons magazine at Hy-Vee stores, and pick up your free copy today! Holidays don’t need to be a hassle. Check out these timesaving, easy-to-do ideas. Dreaming of BBQ and burgers? Learn about our wide selection of grills—charcoal, gas, ceramic and smoker varieties—and fi nd some tasty recipes, too. Show your pride and take it up a notch for your grad’s big day. Knock out a half-hour each weekday to meet your goals.